Oh I do like to be beside the seaside, I do like to be beside the sea, so when I was offered tickets to see The British Musical Fireworks Championship in Southport, of course I jumped at the chance and decided to make a little trip of it so I could show Boy all the best bits of one of my favourite places. We arrived around lunchtime so our first port of call was filling our rumbly tums. Nostalgia Tearooms is popular with older clientele but being a granny myself I really enjoy sitting in the sun and enjoying the homely food that's served by waitresses who wear proper frilly aprons and caps to match the vintage tearoom vibe. The staff are really friendly and their potato hash (or 'tater ash' if you're truly Northern) reminds me of my nana. Full of food, we decided to walk it off, and walk we did, totalling 19,797 steps that day! 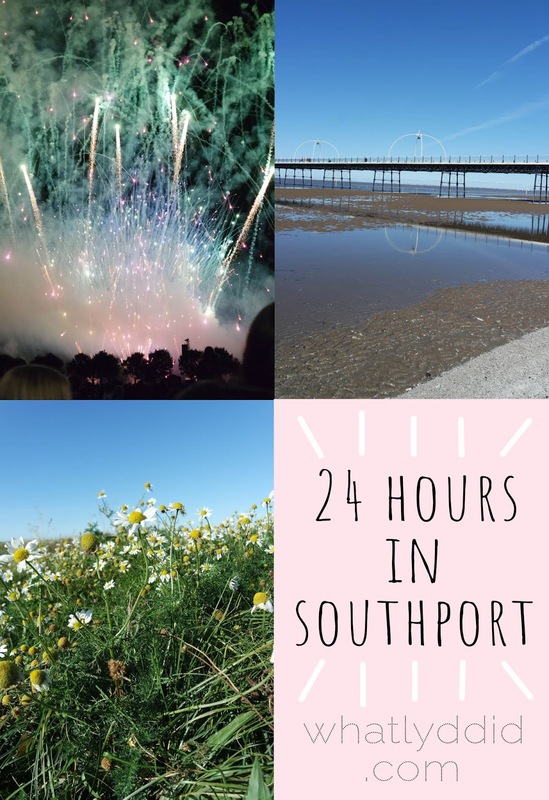 There are loads of good places to stretch your legs in Southport. First we strolled through the park, which has fountains, swans, a miniature railway, a fab children's playground, and even pedalos to take around the lake in Summer. Sadly they weren't out when we visited- much to Boy's relief. If you have children and a picnic you could easily spend hours in the park alone. Since we have neither sprogs nor picnic, we ventured on to the beach, crunching razor clam shells and hunting for sea glass and other treasures the shore washed in, then followed the steps up to the pier. Despite visiting many times, this was one attraction I'd somehow missed. At the end is a little cafe-come-arcade with all sorts of old games, and on a clear day you can see right over to Wales and The Lake District. It was breezy but so peaceful to just sit there and watch the world go by. A trip to the seaside almost always calls for ice cream, and with an even bigger walk in mind I decided it was high time to refuel with a chilly treat from Rossi's on Neville Street. Their homemade ice cream is rich, luxurious, and our Maltesers and chocolate orange cones were both delicious- I was very sad when some of mine dripped while I was absentmindedly stroking a stray cat! The big walk I had planned was a short drive away, over on the RSPB marshes and bird reserve. Purely by chance our visit coincided with the migration of the many hundreds of geese who had flocked there, ready to take off to warmer climates. All day and night we saw (and heard) them flying overhead. It was a sight to behold, but one that made me quite sad, as I worried some might not make it there or back. I began to feel the same way about us as we walked out on the salt marshes, spotting dog prints in the sticky mud, crabs in the murky pools, and samphire sprouting by the path. If you need time and space to think, this is the place to be. The walk is very quiet and calm, but also feels very long, so be sure to wear your comfiest shoes. After a shower and tea break back at our guest house, it was time to wrap up and head to Victoria Park (yep, another park) to see those famous fireworks. Apparently they're something of a tradition, and judging from the thousands of people lining the park and streets, one that's well loved in the town. Sadly I think that raised my expectations a bit too high. There were two displays on the night, the first of which was amazing, with fireworks twirling and trailing sparkles overhead to a soundtrack including The Greatest Showman, Whitney Houston, and a speech from Stephen Hawking that made me quite emotional. The second display was Rocky themed and unfortunately fell victim to a few technical hitches. While I appreciated the beauty of the fireworks, I felt that both shows were quite short and I left thinking "was that it?". Like the park, perhaps this is something best enjoyed by families who can experience the wonder through their children's eyes. My advice is to enjoy the atmosphere and make the most of it- take children/nieces/nephews/young siblings, put glitter on their faces, feed them a few doughnuts, and watch them have a ball singing and dancing along. 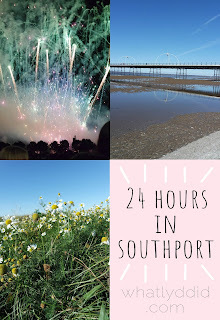 The next morning I woke up with the lovechild of a sinus infection and flu so I'm afraid we did cut our trip short, but '22 hours in Southport' doesn't have quite the same ring to it. We stopped off at Dobbie's garden centre, which has a great cafe, farm shop, and seasonal displays, but my original plan was to drive 10 minutes over to Churchtown. 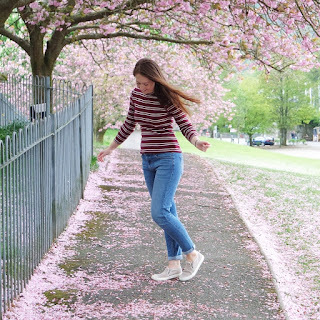 This little village has gorgeous botanic gardens with a mini farm, lovely pubs to lunch in, adorable old buildings and shops, and even a Peaky Blinders themed bar! I'd highly recommend a visit if you're in the area. Where would be your favourite place to spend 24 hours? My tickets for the British Musical Fireworks Championships were compensated in exchange for honest review.